I am going to walk you through how I started my website so that you can understand how to create a blog. As I have explained in my first post on how I started my blog I used the Sitesell program to develop my website. It is very strong on training, so the first step (or Day 1, as they call it) is simply learning about their philosophy and methodology. It is all background, but it is important. I won’t go much into the Day 1 stuff, because Sitesell does it so much better than I do. Here is the summary: Create a site where people will want to be, that will give them value, so that they respect the authority you bring to the subject. This warms them up to receive what you offer, which, in one way or another, means money in your pocket. That one way or another gets tricky. In my case it is mostly visitors clicking on someone else’s ads. Others sell their own things. Whatever it is you offer, people are inclined to buy because you have pre-sold them with good content. Are there other ways of doing business? You bet, but most of you despise those other ways. The Sitesell program is not built on flash, it is built on substance. Day 2 is where you start laying the foundation for what will turn into a productive website. This is where you “find and develop your best site concept” as Sitesell describes it. Almost anything can be the basis for a site. Sitesell helps you to evaluate your skills and interests and identify what has the potential to be a profitable website. Perhaps I should not have labeled this page "how to create a blog". I should have labelled this page "how to create a blog that gets read and makes money" because that is what I wanted to do. Hopefully it is what you want as well, because all of this Day 2 stuff is important if want all that "gets read and makes money" part. If all you want is to learn "how to create a blog that doesn't get read" then you need to go to Wordpress. Part of this is brainstorming. Here you do a personal inventory to develop a list of potential site concepts, which you will then narrow down to your best candidates. Part of this step is a numerical evaluation of these site concepts using special tools that Sitesell has developed. The Seed Generator Brainstorm tool will take your Site Concept words and develop a large list of potential keywords that you can use with your Site Concept. With these keywords you get an index value of the demand for those keywords. This gives an indication of how often those words are used as search terms on the internet. You also get an index value of the general supply of sites that use those words as keywords. By dividing the demand by the supply you come up with a third number that gives an indication of the winnability of those keywords. If a lot of people are looking for certain keywords, and there is a limited supply of sites that supply those keywords then there is more opportunity for you to take one of the top spots in the keyword search. 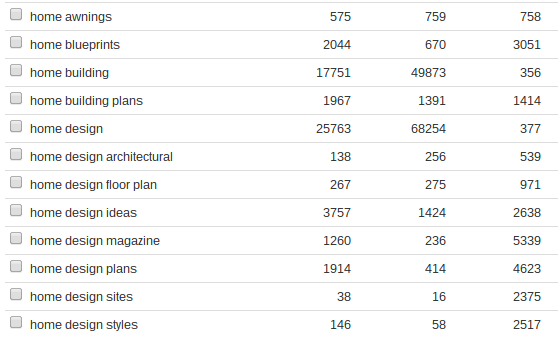 Take a look at some of the keywords that I generated when I put in “Home Design” as a site concept. This is just a portion of the words. Several hundred were generated. Note the word combination that I plugged into the seed generator “home design” has a high demand (the first column) but an even higher supply (the second column), so the “profitability” number (the third column) is low. “Profitability” is the name of the column, but “Winnability” is a better description. Actually this list has had lots of words added to it since I ran the original seed generator. The seed generator weeds out the low volume words, but you will add in a bunch of words in later steps as you develop a plan for populating your site with lots of pages that are geared to profitable keywords. Some combinations are very winnable, but lack enough volume to drive much traffic to your site. For instance “home design sites” only has a demand of 38. Since this is an index value it is not apparent to the new blogger that this is too small for a site concept, but Sitesell gives some guidance in their training. This might be okay as a keyword for a specific page, but you wouldn’t want to have your domain using “home design sites” as a primary keyword. A key lesson you need to learn as you discover how to create a blog is that you will be investing a lot of time in what you do. You need to have enough passion for that topic to carry you through. Take a look at bathroom design. This is plenty big enough for a website. I had installed a bathroom, so I had some expertise. It is a decent candidate based on the metrics. However I really wanted to write about more than bathrooms. It could be a very profitable site, but it wasn’t where I wanted to go with my site. Besides, it would get a little creepy asking people if I could come in and take a picture of their bathroom. Consider beach house floor plans. It turns out that there is a lot of money to be made in selling house plans. If I had access to lots of plans or had some special relationship to suppliers of plans this might be a good specialty niche. However I do not have much to offer in the way of plans, so I looked elsewhere. Where I ended up was “house design”. It has enough demand to support a lot of visitors. As a topic it is broad enough to allow me to go in some different directions. For instance I could discuss architectural concepts, look at various house styles and get into projects for making your house nicer. It is not as constraining as “house design plans” would be. Its drawback is that it isn’t as high in “profitability” (the third numbers column) as some others. I could have picked “house designs” and gained a lot in “profitability”. I think I chose “house design” over “house designs” because the latter sounds like you are talking about specific house designs, which sounds a little like house plans. Sitesell has several tools at your disposal for investigating various keywords. Some of these are available outside the Sitesell environment, but Sitesell links to them and makes it easy. Others are services that would normally cost you a monthly fee, but Sitesell has a contract with them so it is covered in your monthly fee. You can use these to find out what you kind of competitive space you are moving into. You will get an idea of what kind of advertising rates are paid for those keywords. You will learn which are the top sites in that space. In my case I realized that there were two different types of sites that used “house design” as keywords. There are sites that focus on interior decoration and there are sites that focus on architecture. My site was going to lean towards architecture, but most of the top architecture sites focus on new construction. These tend to be modern custom-designed homes and the photography is commercial grade. Essentially the designers and builders promote their work by having professional photographers take beautiful images and then submitting these to these architectural websites and magazines. This was going to be my competition for anybody searching for “home design”. This was a pretty intimidating field to be entering. I had to decide if I could compete in this field. Against the big boys. In the end I decided that since I would not be focusing on what is new and trendy that I was really carving out a different workspace. I might share the keywords and lose out against them on the main domain, but I could win the keyword fights for a lot of individual pages. In fact this is a basic strategy at Sitesell. The topics for individual pages can be narrow enough that you win the battle for a lot of individual pages and build up credibility. Eventually this will translate into credibility for the domain and you will find that you can compete against the established sites in that domain. This brings me to Day 3 (Step 3) where I flesh out the basic structural plan for my website. Here I developed a basic plan for what types of pages I wanted to include in my domain and what tier 2 pages should look like. This is a crucial step in the Sitesell program for how to create a blog. Many people find that the site concept they were envisioning breaks down when they try to plan for all the pages that will exist under that domain. Either they end up with a lot of low value pages that won’t generate traffic and income, or they find that the topic is too narrow and won’t have the breadth they need to make a decent site. You plant your tier 2 pages with the same basic tools that I have already discussed. You identify what topics you should include based both on profitability and what makes sense based on your overall vision for the site. Now let me state here that not every page I have built has been based upon the idea that it has to pay for itself. I have lots of pages that will not in themselves attract a lot of traffic, but which I consider necessary for the overall value of my website. For instance I have an architectural dictionary as part of my website. This includes many pages with low value keywords. I may not get much traffic for some of those words, but that dictionary provides a valuable service and helps my credibility. It isn’t very big yet, but as it grows in size it adds to the general authority of my site. At least that is my theory. Besides, some things you do for love and not for money. What Sitesell has done for my structure is to focus my content on keywords that can draw traffic. I might write about the same thing as if I had never heard of a keyword, but I write with the keywords in mind. Sometimes this is constraining. Often it is frustrating. But if you read my lead-in article you will know that I want to be read. Proper use of keywords helps make that possible. Once you get around to writing articles you will find that Sitesell also has tools to grade your webpage, to evaluate if you have used your keywords in a way that will cause it to be ranked high by Google. There are many tools that Sitesell offers that you can find elsewhere. This is one that probably isn’t available from other vendors (but perhaps I am wrong on that count). For instance, the AnalyzeIt! software tells me that I need to add more uses of my keyword "how to create a blog" so I have added this totally gratuitous paragraph. Actually it isn't gratuitous because it rather nicely illustrates the tools available with the Sitesell program. A long-tailed keyword like "how to create a blog" is difficult to fit into normal conversation, but that is true for your competition as well. Usually these type of keywords can find success without having the perfect number of keyword mentions. In all my discussing about how Sitesell helps you understand keywords and their value you might get the idea that this is just a numbers game. On the contrary the Sitesell Program emphasizes quality content. Think of it as a tennis game. You have to get the ball over the net and between the lines, but that alone is not sufficient to win the match. Keywords are necessary to get the traffic, but content will win the game. So mentioning "how to create a blog" often enough will help the page rank, but it is the content within that has held your attention on my wordy and way-too-long article. So, back to my story. House-Design-Coffee.com. I have explained the “House Design” part. Why coffee? If House-Design.com had been available I would have taken it, but the good keywords are taken as domain names. So I had to modify it in some way. I struck upon the idea of having a conversation about house design over a cup of coffee. It probably wasn’t the best idea I’ve had, but it works. It has the benefit of being a little quirky, so it is perhaps memorable. If I had to do it over again I would choose a different name. Chances are it would be just as bad. I had long used the name “Homesower” on my emails, so I could have gone with that. In a sense I am using that as a brand for myself. There is some value in having a separate brand for the website. What this really means to you is that you can take my advice on how to create a blog, but don’t take my advice on naming that blog. At the end of Day 3 I registered my domain name. While the name is important, the critical point is that by the end of Day 3 you have a very good understanding of your site concept and what kind of keyword articles you will be creating as you build your site. Don’t get hung up on the whole “Day” concept. They are just steps. It probably took me a week to clear the first three days and that was while laid up, so I had all day to train and to work. If it takes you a month and several attempts this will be a month well-spent. If you are interested in learning more about Sitesell from Sitesell itself, then go to this slide that lays out the 10 day Sitesell program. If you are considering the major competition then perhaps you want more of a head-to-head analysis. Wordpress is the big potato in this field, but its clients don’t usually flourish. Did you know that sites hosted on Wordpress.com averaged 6.4 visitors a month? That is averaged. That means many had less. Do you want to know what Sitesell sites averaged? 6,400. Per site. That is a 1000-to-1 advantage. Did I mention that I wanted readers? I have them. Over 10,000 unique visitors this last month (January 2013). Click here if you want the full comparison with Wordpress. If you just want to hear more of my story, then check out how I created my webpage with Sitesell's free blog templates and web software.